I have noticed that round kitchens are being mentioned more and more. The designers that have been frequently blogged about are those at Pedini USA. Pedini designs ultra-modern kitchens and have been known to take on projects for celebs such as Ronaldo and Leonardo Dicaprio. 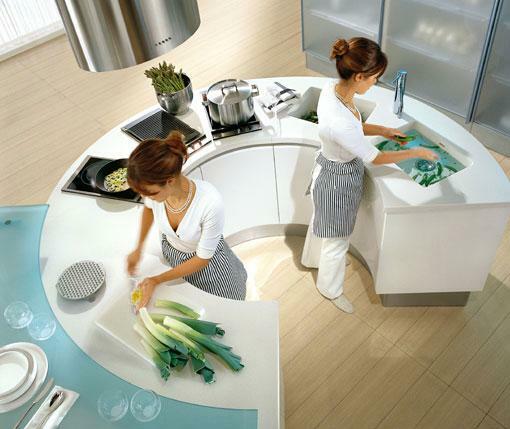 Pedini’s round kitchen design is a remarkable design that adds convenience and a great look. The design is major space saver and don’t worry about not having enough room for a helper, there is plenty of space on the outside where the cooking area continues. This is sure to promote home cooking and may be the new rage in the new decade. ~ by Fine Line Pacific on December 14, 2010. Whoa, way to think outside the “box kitchen.” This looks amazing and I bet it’s a real time saver with everything so close at hand. There are so many different variations but it’s almost like standing inside the kitchen island!